ABBEYFEALE ON LINE! : LIMERICK ALL IRELAND CHAMPIONS! There were joyous celebrations around town on Sunday night following Limerick’s magnificent win over Galway in the All Ireland hurling final. 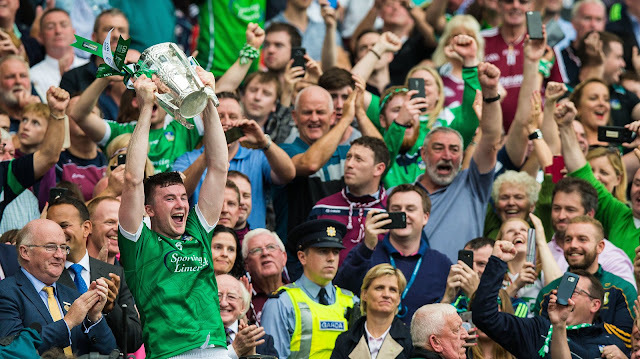 The Sporting Limerick jersey was being worn with pride, and the green and white flags fluttered from passing cars and over the streets and buildings. We had waited forty five years for this day and were determined to enjoy every moment of it. There was also a great sense of relief. After so many near misses, we had finally managed to break the hoodoo and come out on the winning side. But then Galway suddenly cut loose and scored two goals and a point in injury time to narrow the gap to one. And when Joe Canning stood over a long-range free as the clock ticked down, visions of the Offaly nightmare in 1994 came back to haunt us. Surely lightning could not strike us twice? Thankfully for Limerick, Canning’s free fell short, the ball was cleared and the referee finally called it a day, creating mayhem and releasing forty five years of pent-up emotion and joy. Limerick. All Ireland Hurling Champions 2018. It has a nice ring to it. And the heroes of seventy three. Like a tide rolling in from the sea. Supporters were there from all over. Some travelled from lands far away. For forty five years we had waited. Would the famine be ended today? And are met with a deafening din. And watch as the ball is thrown in. In Limerick, a great hurling star. And strokes the ball over the bar. Graeme Mulcahy is a skilled corner forward. Kyle Hayes was named Man of the Match. Declan Hannon, an inspiring captain. Seamus Flanagan makes the high catch. Mike Casey goes up for the ball. Always ready to answer the call. Helped out by hard-working Cian Lynch. Refuse to give Galway an inch. O’Donoghue and Condon all set. When he stuck the ball in the net! As Galway came chasing their crown. But the lads from The Treaty denied them. To a man they refused to back down. The green flags fly over Adare. Liam McCarthy is heading for Limerick. Pairc na nGael, Ennis Road; he’ll be there! Who guided our team to this win. And a mention for JP McManus. Sporting Limerick are champions again!